Truly Glenmorangie are the master artisans of the Scotch Whisky world. Dare I make such a claim? Every step I take into the Glenmorangie stable I find something even more amazing. Actually I think my words on the night were the Glenmorangie Quinta Ruban is BLOODY AMAZING! With the recent eve of Fathers Day (for those lucky enough at this stage to be the focus of the celebration) one finds the stores filled with with new and wonderful whiskies. In fact the focus of this review is not what I received (thats been left for another review) but what arrived in The Grey Bush's (my father-in-laws) stash. Yes, it was the Glenmorangie Quinta Ruban. WOW! Was it my gift? Well, no, I thought to give the Glemorangie Original expecting then in time to progress my gifts up the ladder. So it is the Mother-in-Law that needs thanks for this gift that we have both partaken in. 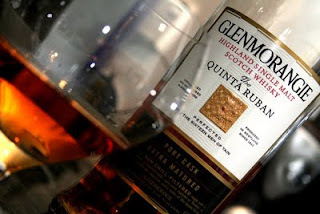 What to say about the Quinta Ruban... it has everything found in the Original and so much more. Finished in Portuguese Ruby Port Pipes (Barrels) this is such an easy, oh so easy whisky to drink. Colour: The colour is dark golden ruby which must be coming from the port barrels except for the potential colouring. Nose: An immediate hit of the signature citrus Glenmorangie but with obvious hints of mint to the nose. If you are a port appreciator, such as myself, it is easy to sense the aged fruity port flavors coming through. Take a deep breath and hold it in and then go back for more. At 46% one would be expecting a slight harshness on the nose but it's just not there at all. Taste: Amazing! Like I do with all my whiskies these days I sacrifice the first taste and spread it around my mouth quickly trying not to think too much about it, allow for sense saturation, before letting it all settle for a minute. On returning for a second and more serious sip there is velvety butter, minty cocoa, orange citrus, berries and a dryness at the same time but only so subtle. Finish: Soft and even from mouth to throat, a medium recession in flavor and when you think it is done it lingers on only to enhance the nose before the next sip. I have never drunk a scotch whisky so quickly. Yes I was left wanting and I did receive. I highly recommend though most may find this is a after dinner digestive (recommendation orange glazed pork or duck) to settle in and enjoy a dram or three. Certainly I am rating this my favourite 'expression' of the Glenmorangie stables but there is still a few to try yet. If I gave a dram it would be a 7 out of 7. Great flavour and really excellent value.